"NBA" redirects here. For information about the Nintendo 3DS application with the same abbreviation, see Nintendo Badge Arcade. 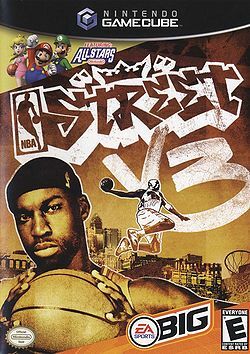 NBA Street V3 is a basketball video game developed by EA Canada and published by EA Sports Big in 2005 for the Nintendo GameCube, Xbox and PlayStation 2 and the third game in EA's NBA Street series. The GameCube version features Mario, Luigi and Princess Peach as playable characters, collectively known in-game as the "Nintendo All-Stars". This is in response to a deal between EA and Nintendo in which EA would include Nintendo characters and properties in a few of their games. A basketball court based on the Mario franchise, named Nintendo Court is also featured in the GameCube version. This is the first game to feature Princess Peach's main current sports attire other than her golf/tennis minidress, predating Mario Superstar Baseball. This page was last edited on October 7, 2018, at 01:19.